A National Football League statement said Evans had been suspended for violations of unsportsmanlike conduct and unnecessary roughness. 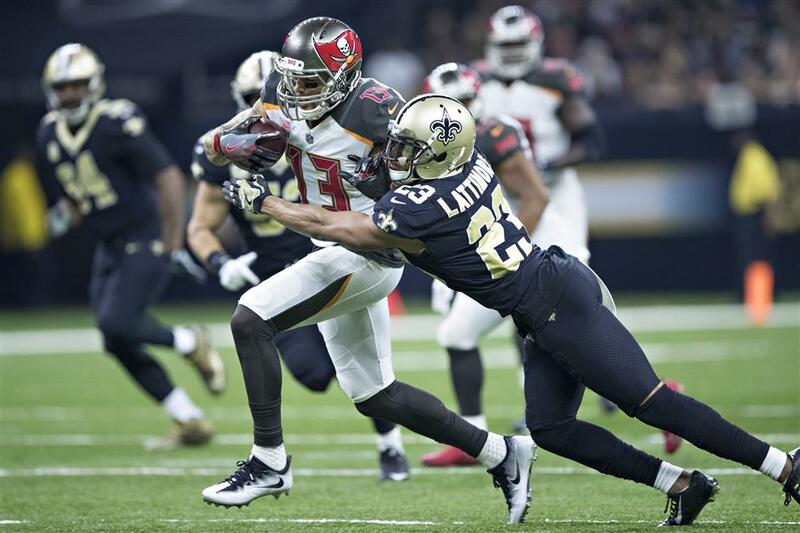 Mike Evans of the Tampa Bay Buccaneers runs the ball and is tackled by Marshon Lattimore of the New Orleans Saints during their NFL game at Mercedes-Benz Superdome in New Orleans, Louisiana, on November 5, 2017. The Saints won 30-10. Tampa Bay Buccaneers wide receiver Mike Evans was hit with a one-game ban on Monday following an off-the-ball hit in his team's defeat to the New Orleans Saints at the weekend. Evans landed in hot water after an incident involving Saints cornerback Marshon Lattimore during Sunday's 10-30 loss. Evans saw red after Lattimore shoved Bucs quarterback Jameis Winston when the signal-caller appeared to tap him on the helmet. Evans responded by flying into the Saints player with his back turned, flattening Lattimore. "During the third quarter, after a play had ended, you struck an unsuspecting opponent in the back, knocking him to the ground," Evans was told in a letter informing him of the suspension. "Your conduct clearly did not reflect the high standards of sportsmanship expected of a professional." Evans had admitted fault in comments to reporters after the game, explaining that he had been attempting to protect Winston. "I just let my emotions get the best of me," Evans said. "Something I shouldn't have (done). It was very childish. I just saw the shove, then I thought he was going after Jameis. I was trying to protect my quarterback." Also, New York Jets wide receiver Jeremy Kerley was handed a four-game ban on Monday after failing a drug test for a banned steroid, the NFL confirmed in a statement. Kerley, 28, said in a statement he was "shocked" at how the substance, Turinabol, had entered his system. "I am 5'9" (1.75-meter) tall and 180 pounds (81.6 kilograms), and I have never used steroids in my life," Kerley said. "I'm a good athlete but anyone can look at my body composition and tell that I'm not a steroid user. "While I did not have enough time prior to the deadline to resolve this case, I fully intend to investigate this matter until I am able to figure out what caused the positive test, because I know that I have done nothing wrong. "When I find out what substance was tainted, I will pursue all remedies at that time because this is not right. I have and will always be a clean player, and I look forward to returning to the Jets to play against the Saints next month." Kerley will be eligible to return to the Jets roster on December 11. The Texan has bagged 22 receptions for 217 yards and a touchdown this season.